Today’s blog post presents a Powershell script that can be used in multi-instance environments (eg clusters) to identify high CPU SQL Server threads. The script uses the performance monitor counters for threads. With these registry changes in place the Powershell script simply fetches five samplings of the thread % processor time. For each distinct process ID it groups on processID/threadID (eg 3012/4896 for the example above) and calculates the average, minimum, maximum and count for the five samplings. It finally sorts by the average descending and selects the first five rows. $PerfCounter = "Thread(sqlservr*)\% Processor Time"
Please take note of the line continuation back ticks. You can use this same approach to identify other performance metrics at the thread or process level. It’s possible to generate various type of storage utilisation reports using this DMF. Please observe the line continuation back ticks. SMO is used to fetch data file and log file information (file name, size and space used). The IsAccessible property is checked to ensure that we process data for online databases only. This data is stored in an array named FileArray. The only complicated part of the code is where we append the volume data to the file data. The idea is to create one array holding file as well as volume data. You can see that we’re aiming for the same result set we see for the screenshot for SQL Server 2012. The code achieves this by doing regex matches between the full file names and the volume names. The volume name will appear in the leading part of the full file name. 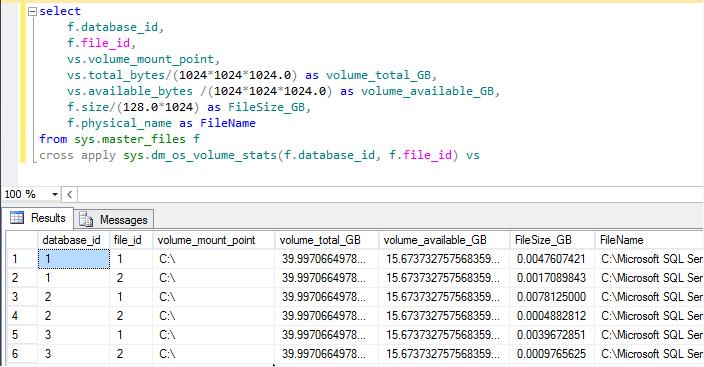 If you are using mount points you’ll have two matches – one for the root volume (eg D:\) and another for the mount point (eg D:\SQLDATABASE\DATA). We obtain the mount point by doing a descending sort on matched volume names and selecting the first one. This matched volume’s data is stored in the Volume property (PSCustomObject) alongside all the other file properties for this file. The script analyses database and log files only. Backup space utilisation could be analysed using a similar approach.